After our long day of driving and excitement on Saturday, we took Sunday a little bit easier. At Paul's aunt & uncle's house, Sunday is "pancake day." We got up a little late and spent the morning with Paul's uncle and their son, eating pancakes and talking. Then, Paul went golfing with his aunt and uncle while I went to the mall and spent a bunch of time at Barnes & Noble. Pretty soon after they got back, we had to leave to visit Nick at his new residential treatment place. Just like Paul's aunt & uncle said, it took about 10 minutes to get there. Tired, we went "home" to a delicious supper of homemade fettuccine alfredo and garlic bread. YUM! Oh, and watched the Olympics. 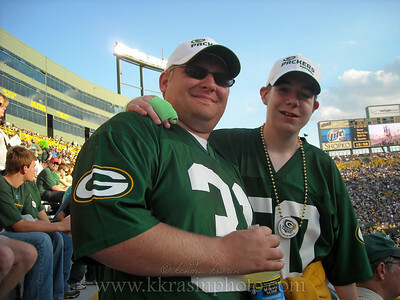 On Saturday, August 8, Paul & I headed out to Green Bay. 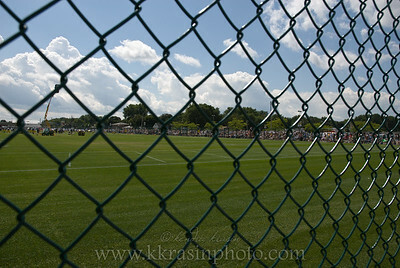 We got to the Green Bay Packers training camp about an hour & a half before practice was scheduled to start. We took a quick walk along the practice field - where people were already in the bleachers & the entire fence was lined with foldable chairs "saving" spots - to find somewhere to get some lunch. 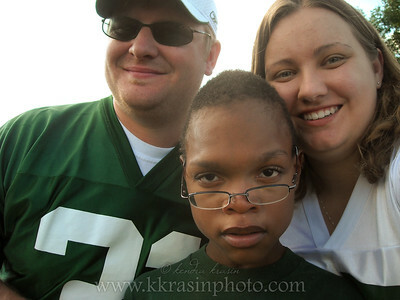 We got back & decided to watch the players head over to the practice field. 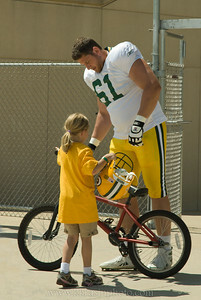 A little while before practice, a staff member asked all of the kids who were waiting with bikes to come inside the fenced-in area by Lambeau. The players then came out & chose a kid. The player rode the bike to the practice field while the kid ran (or rollerbladed) along with them, carrying their helmet. 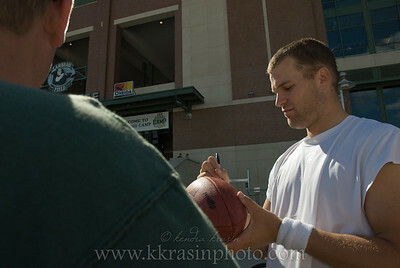 We decided to wait by Lambeau to see if Paul could get any autographs after practice. The players rode the bikes back & did sign some autographs. Unfortunately, it was really crazy and busy and everyone was very pushy, of course. Paul got Matt Flynn's autograph on his NFL ball. We spent the weekend at Paul's aunt & uncle's house. They were great and helped us find some fun things to do. We ended up going to Curly's Pub in Lambeau for supper Saturday night. We sat by a window over looking the fenced and gated player parking. While we were eating, Paul noticed that there was a kid out there, waiting for players to drive out. Some of the players were actually pulling over! Paul decided to head down there after we ate and risk being a little "stalker-ish" but not pushy. We sat down there & some of the players did, in fact, pull over. Paul got a couple of coaches' autographs, Will Blackmon's, and some other players. Then this family came and sat down, but they didn't seem to want any autographs. 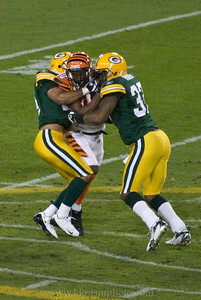 They saw Donald Driver walk to his Hummer & started yelling. At that point, Paul & I were both thinking, "Great, he's not going to stop now." The mom of the family stood at the end of the bike rack and waved while Driver drove out. Suddenly, we noticed that he was slowing down. The mom went right up to his window and they were talking about their kids. Paul was totally starstruck & just stood there until the daughter told him to go up. Driver stayed and talked (and signed Paul's ball) for quite a while. It turns out that the family have been huge fans since his rookie year, so they kind of know him. We stayed while the family left & tried to get some more autographs. At one point, Paul recognized KGB in one of the cars...he drove right on past. But right away this huge truck pulls up. Scott Wells signed the ball, pointed & said, "That was KGB. That was rude." :c) Too funny! Well, after all of the excitement of getting autographs, we went "home" and watched the Olympics. Paul couldn't sit still! I'm planning on taking some good documentation-type photos of Paul's ball and I'll post those when I have a chance.